On May 5, 2009, Philip Morris International's CEO, Louis Camilleri, sought to discredit tobacco control advocates at his company's annual shareholder meeting in New York City by repeatedly characterizing them as "not having their facts straight." In fact, it was Camilleri who deliberately and repeatedly made false statements about the company's promotions to young people around the world. The information below should set the record straight. THE TRUTH: Read on and decide for yourself! CAMILLERI: We have not been present in Nigeria for more than a decade. THE TRUTH: Here's a photo of a Marlboro billboard in Nigeria (~March 2005). And further information about PMI in Nigeria is contained in Tosin Orogun's statement at the 2005 Altria meeting, at which Camilleri acknowledged that PMI had a presence in the country. CAMILLERI: I think it is important for all shareholders here, ... to know that we are doing everything we can to avoid marketing to children. We are serious about it. We get attacked unfairly. Let me give you one example; because it's part of the list that the tobacco advocates try to render the issue even more emotional. One of the attacks, we have, is that we also do music promotions in Pakistan and that supposedly we have branded mobile cinemas in Pakistan. Well, the facts are that those branded mobile events used to be run by Lakson before we purchased them back in 2007. We purchased them, we stopped the branding of those events, both of the Diplomat and Mobile gold brand, and more recently we stopped the whole promotion. So when I say that people should encourage us to go to emerging markets that's a perfect example of what we can do when we are there. THE TRUTH: Camilleri cites a marketing campaign by Lakson Tobacco Company (which PMI purchased in 2007) for its Diplomat cigarette brand that took place in Karachi and involved a long branded truck with a mini cinema hall inside. The entry ticket for the cinema hall was a pack of cigarettes. According to Pakistani sources, the main target of the campaign was youth from low socio economic classes. This advertisement for the event says: "Buy one Diplomat pack and get participation in the world of entertainment with interesting films." The particular event was held 2-10pm, March 2-6, 2008 in Safforan Village, a poor slum area of Karachi. Advertisements for it remained in area stores through December 2008. The ad itself mentions March 2008, which is a year after PMI acquired Lakson Tobacco, and the promotion is clearly branded. While Camilleri does not provide specific dates by which the company stopped the branding of the mobile cinema hall events and eventually the whole promotion, the fact is while the promotion may have been run before PMI acquired Lakson, it was also run for a significantly long period of time afterwards and advertisements for it stayed in stores for an even longer period of time -- over a year and a half after PMI acquired Lakson. Indeed, a "perfect example of what PMI can do in an emerging market." CAMILLERI: I think that all the reports that we received, that the filters we have in place to ensure that adult smokers are the ones who attend those concerts and have to show identification that is sponsored by governments, and the Indonesian government, we do not have children attend those concerts. 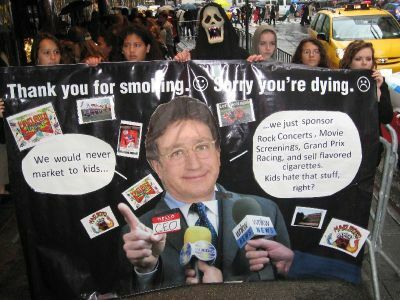 THE TRUTH: According to Indonesian tobacco control advocates youth under age 18 attended a Marlboro Filter Rocks in Orchestra concert in January 2009. And on April 25, 2009, just a little over a week before PMI's annual meeting, A Mild Live Wanted, a nationwide band competition, took place in Jakarta. Dina Kania, an Indonesian advocate, attended the event and saw many youth under age 18 there. Indeed, the audience was very young, judging from this photo from the event. THE TRUTH: Check out this webpage and decide for yourself!